Magnabrite | Visual Aid Lab, Inc. The original Magnabrite Light Gathering Magnifier has been helping people like you see clearer and brighter since 1950. Crafted from solid, optical-grade acrylic, the Magnabrite from Visual Aid Lab, Inc. intensifies all light that passes through it. Unlike other magnifiers, this one does not need batteries or bulbs for precision performance, and there is no frame to obstruct the viewer's vision. Looking for a unique client gift? A personalized Magnabrite is the perfect solution. Your logo or message can be laser engraved around the rim of each magnifier. You can also choose either a walnut or oak base to complement your gift. Our specialty, laser-engraved Magnabrites are great for conferences, meetings, awards of recognition, incentives, employee gifts, and customer/vendor appreciation. Each magnifier comes with a velvet, double-drawstring pouch you can easily carry in a purse, carry-on luggage, beach bag, backpack, or briefcase. 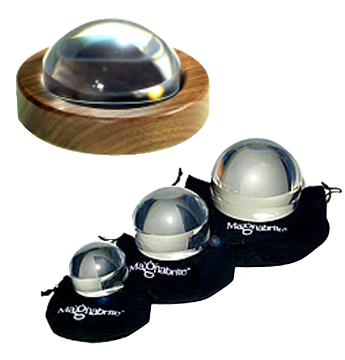 The Magnabrite is available in four sizes, providing many different applications for use anytime you want to see clearly. Its uses include viewing stamps, coins, phone books, newspapers, maps, crafts, photos, models, and magazines.